Persistence Market Research has rolled out its latest market findings in a new report titled “Aerospace Galley Trolley and Container Market: Global Industry Analysis 2012-2016 and Forecast 2017-2025” presenting readers with in-depth insights and intelligence on aerospace galley trolley and container market from a worldwide context. The research findings cover some of the significant factors and aspects that have molded the overall scenario of the global market, opportunities for manufacturers and suppliers to advance in the upcoming years, wavering trends impacting the dynamics of the market, and other profitable insights covering all the key market segments. Trolley and containers used within the context of an aircraft galley are nothing but a part of galley inserts utilized for the purpose of storing and transporting food and other relevant passenger service items within the aircraft cabin. These have become a regular fixture within the aircraft galley but also can be customized in order to increase or decrease the number in the aircraft as per the requirement and passenger count. The research report features two separate markets from the perspective of the overall market. The first market deals with galley trolleys used in the transportation of food and beverages among others within the aircraft cabin and the external food caterers while the second market deals with small storage boxes called containers that are usually affixed to the galley module. The market size of both the markets are given in terms of US$ Mn, while the volume of both the markets are presented in terms of units. Each sub-segment within the main segment is clearly stated and defined in order to help the reader discern the intricacies of the market. The research report also defines important drivers, obstructions and trends affecting the growth of the market during the forecast period. Airline carrier preferences, MRO service providers, value chain, forecast factors and Porter’s Five Forces Analysis are also examined and presented in the research study. Macroeconomic factors affecting the sales and demand for aerospace galley trolley and container are also taken into consideration. The market volume of both galley trolleys and containers is deduced on the basis of demand generated from the deliveries and current fleet of commercial aircrafts on a global level as well as the demand from airline food caterers. The aerospace galley trolley and container market is forecasted from the year 2017 to 2025 for a period of eight years; the year 2016 is taken as the base year for the purpose of generating market numbers. Additionally, historical data ranging from the year 2012 to 2015 is included in the research study for all the segments. The details regarding the estimation of the market are given in terms of compound annual growth rate or CAGR, while other significant criterion namely yearly growth, absolute dollar opportunity, market attractiveness index and basis point share analysis are also presented in the research study to help the reader gain clear and complete insights on the market. The study also features an in-depth scrutiny of the major players involved in the manufacturing of galley trolley and containers. Trolleys and containers utilized in commercial aircrafts are considered a part of aircraft galley primarily falling under the umbrella term galley inserts. Trolleys are used for the purpose of transporting food and beverages to the passengers within the aircraft cabin while cabins are small storage boxes affixed in the aircraft galley for storing small items such as food and ice among others. 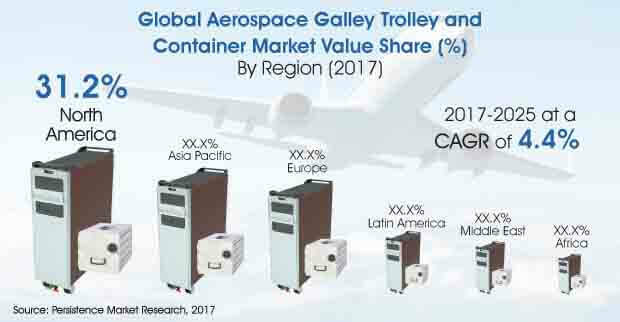 The global aerospace galley trolley and container market is anticipated to grow at a healthy CAGR of 4.4% in terms of sales value generated over the forecast period beginning from 2017 till 2025, driven chiefly by the growth of air travel witnessed over the years. It is a well-known fact that commercial aircrafts that are used to transport passengers have become, in the current scenario, much more than a vessel to get from one point to another. Airline carriers continuously modify the interiors of their aircraft fleet so as to provide utmost luxury and comfort to their passengers without compromising on ticket prices. This dynamic change has brought in more passengers to opt for air travel than other means of transport resulting in high growth witnessed in the number of passengers on a yearly basis. The airline industry has become a very competitive industry with numerous airline carriers entering the market – in particular the low-cost airline carriers offering cheap flights with improved cabin comforts. These factors have led to an increase in the number of orders the airline carriers place for aircrafts to the OEMs. Similarly, these factors have also led the manufacturers of trolleys and containers to ramp up their production thereby increasing the supply as per the demand generated by the airline industry. With an uptick witnessed in air travel, bottlenecks have been observed in the aircraft manufacturing industry with the production output unable to meet the demands placed by the airline carriers leading to backlogs and delays in the deliveries of new aircraft. The duopoly shared by Boeing and Airbus in the manufacture of commercial aircrafts is being challenged currently with few new manufacturers cropping up in China namely COMAC among others entering into the market providing more opportunities for galley trolley and container manufacturers to improve their customer base and overall sales. The market is segmented on the basis of product type, aircraft type, fit type and region. The product type segment is bifurcated as trolley and container which are further segmented in the respective category. From the perspective of trolley type segmentation, meal/bar trolley type takes up the highest market share and is anticipated to hold the leading position in the upcoming years, though it has to be noted that end use of the trolley is not fixed and can be interchanged to accommodate the requirements such as waste bin and folding trolley among others. The same can also be said for the container type segmentation, wherein ice containers take up around 20% of the market share. In the locking mechanism segment for both trolleys and containers, manual locking overshadows electronic locking by a large margin owing to simplicity in design, preference for the former and the associated low costs. On the basis of aircraft type, narrow body aircrafts dominate the market share by more than 50% from a global perspective owing to large demand for aircraft fleet of such aircrafts. However, the penetration of trolleys and containers within each type of aircraft is different and must be taken into account as the number of trolleys and containers increases when wide body and very large aircraft comes into the picture. The airline industry thrives positively in Asia Pacific and Middle East region wherein numerous airline carriers have entered into the market ordering new aircrafts to add to their existing fleet, providing ample opportunities for the trolley and container market to flourish during the forecast period. The market in the North American and the European region is also anticipated to grow but the airline industry in these regions has become stagnant from the past couple of years. Showa Aircraft Industry Co., Ltd.